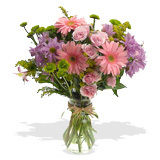 Happy Anniversary Flowers Choose an elegant formal anniversary flower arrangement or a bright informal arrangement to give to your loved one on your anniversary. There are different wedding anniversary flowers for each year of marriage, and sending your sweetheart a bouquet of these flowers is the perfect way to celebrate the occasion. At FlowerFresh we are committed to providing the best price on the freshest flowers, so no matter what your budget you can be sure to find the perfect anniversary flower for you.